Many of my writer colleagues and I are debating our roles going forward. It’s hard to predict what will happen, as so much is unknown until next month when the new president and his party take over the levers of power. 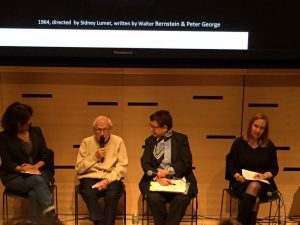 Last week I attended a panel co-sponsored by Film Quarterly and the Film Society of Lincoln Center titled “Film and Media in a Time of Repression: Practices and Aesthetics of Resistance.” The panel featured filmmakers and critics from the United States, Portugal, and Argentina who offered historical and international perspectives. Walter Bernstein speaks about blacklisting during the McCarthy Era. 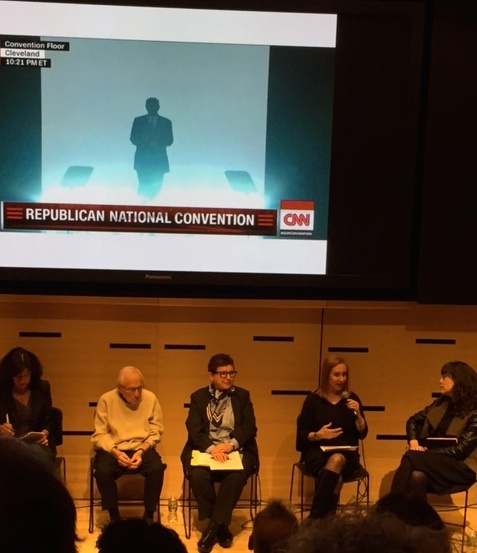 Ruth Ben Ghiat (second from right) shows Trump coming out of the fog, an image drawn from Mussolini’s rallies. The other panelists are, from left, Susana de Sousa Dias, Walter Bernstein, moderator Ruby Rich, and Natalia Brizuela. Media scholar Ruth Ben Ghiat’s presentation was equally concerning. She has studied the rise of Italian fascism under Mussolini and the kleptocratic authoritarianism of Silvio Berlusconi. She also covered the Trump campaign through summer 2016 for CNN and saw many parallels between his campaign and the images and rhetoric of Mussolini in particular. The “drain the swamp” quote came originally from Mussolini. The nurturing of a personal bond with supporters and the encouragement of violence among them is similar. The aesthetics of both are ones of menace. The leader stokes a fear of inchoate enemies that only he can counteract. And it’s always a “he” in this violent, hypermasculine culture. Ben Ghiat felt that we’re still in denial about the seriousness of what we’re facing. Susana de Sousa Dias from Portugal and Natalia Brizuela from Argentina offered perspectives from their respective dictatorships. Brizuela observed that we in the United States are beginners in the art of resistance. We need to educate ourselves in how people have resisted in other countries, and particularly in Latin America. In Argentina and Brazil, for instance, filmmakers have interviewed people in the countryside and in the slums, who tell their stories of survival and who remember the names and the lives of the dead. Many of these videos have gone viral, and they offer a counterpoint to the dominant images of Big Media. It is important to recuperate memory of suffering and resistance to learn from it and ensure that these things don’t happen again. This same process of encouraging ordinary people to tell their stories was the focus of Angela Zito’s presentation. She has helped to make films in and about China from the late 1970s to the present. She showed images from a film that chronicled the murder of a teacher by his own students during the Cultural Revolution, and what happened to his family afterward. These kinds of films made in China have no distribution within the country, but they’re smuggled out and serve as an “archive for the future.” She said that it’s important for artists in resistance to dictatorship to cultivate connections abroad so that works that cannot be produced (or published) in their own countries can reach an audience or, at the very least, not be destroyed. Michael Boyce Gillespie and Imani Perry talked about contemporary African-American filmmakers and historical and contemporary images of Black people. Gillespie asked the question, “Can Blackness be loved?” while Perry expressed her anger at the fact that her mother in Alabama, a veteran of the Civil Rights Movement, will once again be forced to live in a White nationalist police state. She reminded us that “the terror is not new” for Black Americans, and the turning point was the militarized response to the demonstrations in Ferguson, Missouri after the police killing of Michael Brown. She called on filmmakers to create “art that moves us,” and that captures the beauty of Black people. 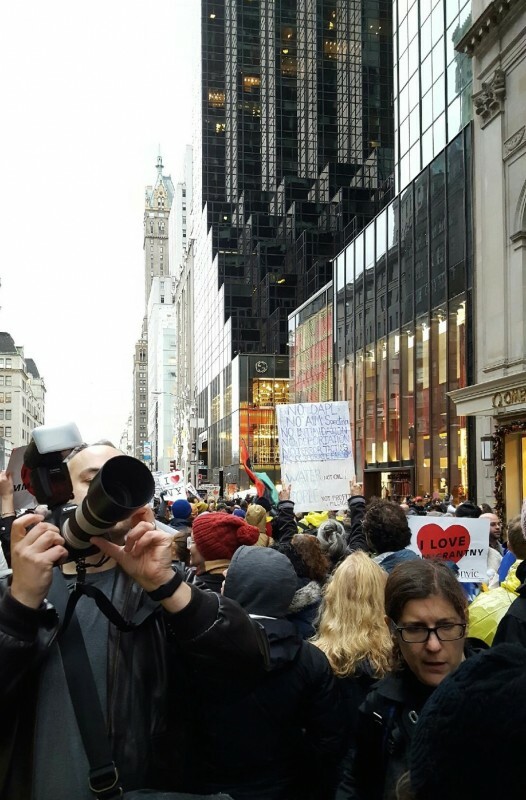 Taking heed of Walter Bernstein’s advice not to confuse words with actions, I attended a rally for #ImmigrantNY yesterday and we marched to Trump Tower. The eight panelists observed that until now in the United States, artists haven’t had to worry about personal safety and freedom (though Bernstein, who experienced McCarthyism, may dispute that). They asked all of us to decide what we are willing to risk of ourselves and our careers, and where we draw a moral line beyond which we will not cross. They pointed out that under the present situation, “the risk is not distributed equally.” It is important for us to reach out to those who are at the most risk. We need to use the knowledge of people with experience in resistance so that we understand power and confront it effectively. When Walter Bernstein spoke, I was on the edge of my seat, hanging on his every word. I felt like a young person sitting at the feet of an elder who told me about the hard times of the past and how people survived, so I could learn how we might survive, too.